Man Fashion Ring, Custom Fashion Rings For Men With Gem Stones. Man fashion rings are not very popular but they do have a fairly large and loyal following. As expected, someone who buys a men's fashion ring would be quite fashion concious and is unlikely to be satisfied with standard designs and options. If you were looking for a fashion ring for men, you would surely look for a source that can custom make your ring for you. Kaisilver as the world's largest online provider of high end men's rings, is the ideal place to order your custom made man fashion ring. Our ring designs for men's rings get inputs from, an intense research conducted by our team of experts into the lifestyle and habits of modern men. When you think of a man fashion ring there will be certain features that you will expect to find in such rings. Firstly, the ring will be quite large and prominent. A man fashion ring would generally have a large head size or a broad band. The gold weight of large rings needs to be good to ensure that the ring retains shape and does not bend and dent easily. Next would be a combination of gemstones in a single ring. Multiple gemstone fashion rings for men would mix and match gemstone colors in the same ring. The selection of gemstones could be based on color or be related to various beliefs like birthstones, lucky gemstones etc. Finally, you would expect a fashion man ring to have a design that is very unique and exclusive. Fashion concious buyers would not like to wear jewelry designs that are very common and standard. It is rightly said that, every fashion ring should have an identity and personality of it's own. You will notice that the gemstones in this custom man fashion ring are mounted to slightly protrude out from the level of the ring. The design can be modified to make the gemstone mountings in level with the ring and not protrude out. You can choose the type of mounting when you place your order for this fashion man ring. 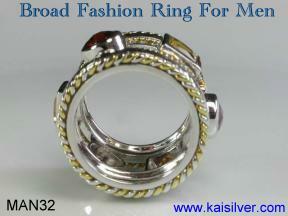 The MAN32 fashion ring for men is a perfect example of how a men's fashion ring should be made. The ring has a very unique and awesome look, the gemstones around the band can be selected as per your preference. The ring beautifully combines white and yellow gold in a ring that looks modern and trendy and yet seems to be close to an antique design. A good gold weight of around 20 to 30 grams gives the ring a bold and majestic band width of 1.5cm. The gemstones in this man fashion ring are set between a gold band on either side and the band has an uneven hammered look. You can ofcourse choose to have a smooth finish instead of the hammered look for your men's fashion ring. It is often thought that men's rings need to be bulky and clumsy to look masculine! Sellers love this notion, as it allows them to sell crudely made male jewelry, without worrying about the craftsmanship. 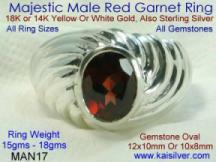 Kaisilver man fashion rings are completely custom made and some of the world's finest craftsmen work on each ring. In the final phase of production, high quality handfinishing is provided for each jewel. The ring can be ordered with all gemstone options and with our direct and preferential access to over 200 million carats of gemstones, we can procure just about any gemstone for you. You can email us with your queries and doubts at sales@kaisilver.com and a team of Kaisilver experts will guide you to make a well informed decision. Since all our man fashion rings are completely custom made, you can choose 14k or 18k yellow or white gold for your ring. We recommend 14k gold for men's rings as the hardness is ideal and makes the ring sturdy and durable. Choosing gemstones for man fashion rings is an important aspect of the ring. Color combination would play an important role in making a fashion men's ring look good. Choosing the wrong color combination for the gemstones can ruin even the best designed men's ring. There are two types of color combinations when making rings with multiple gemstones. The first type of color selection would be where the different gemstone colors contrast against each other. For example, white topaz and blue topaz or pink tourmaline and green tourmaline or aquamarine and pink tourmaline. Blue sapphire and ruby would also be a contrasting color combination for a man fashion ring. The next set of color combination for gemstones would be where the colors match or blend with each other. The MAN33 ring shown on this page uses color matching for the gemstones and the image shows the ring made with citrine and red garnet gem stones. A good blending color combination would be to combine amethyst and tanzanite in the same ring or light blue topaz with a darker shade of blue topaz. Since you have an unlimited choice of gemstones, select a combination of gemstones that you like best and ask our experts for any guidance that you might need. In the above paragraph we have discussed gemstone colors that would look good for a man fashion ring. There is another issue that could influence the gemstone selection for your custom men's fashion ring. Many buyers prefer to include their birth stone in the jewelry that they wear. A birthstone ring is believed to bring good luck and good fortune to the person who wears it. Since the man fashion ring shown on this page can include more than one type of gemstone, you might want to consider combining your birth stone along with the birth stone of your wife in the same ring. With this option you would have an awesome birth stone fashion ring with a good meaning and significance. Kaisilver maintains comprehensive charts for birth stone and gemstones for other occassions Click here for our birthstone charts and you will find complete information on birth stones, anniversary gemstones and also gems to be worn according to the day of the week and season. The MAN32 fashion men's ring has a solid band and the ring weighs a minimum of 20 grams. Our experts will let you know if your ring size calls for additional gold weight. The band width of the ring is 1.5cm and the gaps between the gemtone mountings allow for a free flow of air and will not cause your finger to sweat. The gemstones in this man fashion ring are securely mounted with a gold border for each of the gemstones. This protects the gemstones from side impact and increases the longterm durability of the ring. The braided design on the borders of this ring is a combination of white and yellow gold. You can however order your man fashion ring in single color white or yellow gold too. There are no sharp edges or borders in this ring and this will ensure that the ring does not injure or scratch the skin. You can order this ring as a white gold fashion man ring or as a fashion ring in yellow gold. The image on this page shows the MAN32 ring in a two tone gold color and this option is available at no extra charge. We provide 14k or 18k white or yellow gold as an option but it is recommended that you use 14k gold for this ring. 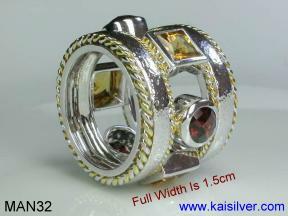 Like most fashion rings, the MAN32 is quite large and has multiple gemstones mounted in the design. The hardness of 14k gold is ideal for such jewelry designs and will help to make your ring more sturdy and strong. This man fashion ring can also be ordered in sterling silver and both silver and gold options will have the same high end craftsmanship. Both silver and gold fashion rings will be true high end jewels and are available in all ring sizes with all gemstone options. Well researched design: Like all the other jewelry from Kaisilver, these man fashion rings have a design that has been studied and researched by a team of expert designers and craftsmen. The design gives equal emphasis to good looks and long term durability. Sharp edges and corners have been excluded from this man fashion ring. All the gemstones are bordered with gold and this protects the gemstones from side impact. The rim of the gemstone is most prone to chipping and breaking and this type of mounting increases the lifespan of the gemstone and the ring. Most jewellers would consider an attractive design to be the only important thing, at Kaisilver we think about good looks and beyond. Good gold weight: Men in general, take much less care of their jewelry as compared to the ladies. This factor has been considered when creating this custom man fashion ring and the ring has been provided with a good gold weight. Kaisilver jewelry typically weighs around 50% to 60% more as compared to what others provide for similar designs. The MAN32 ring weighs between 20 grams to 30 grams and the weight is proportionate to the ring size. This helps to keep the jewelry strong and sturdy and increases the durability of the jewel. The MAN32 men's fashion ring has a broad band of around 1.5cm and many gemstones have been included in the design. The good gold weight is of much greater importance in such large rings with multiple gemstones. Highend craftsmanship: A splendid design and a healthy gold weight mean nothing if the jewel has crude and substandard craftsmanship. Fashion rings and the other jewelry shown on our website are not mass produced, every ring is worked on by some of the finest crafstmen and is handfinished to perfection. Over 3,500 skilled craftsmen and artisans work on all Kaisilver orders under the watchful eyes of seven top notch designers drawn from five nations. The making of your fashion man ring involves an enormous amount of skilled craftsmanship and this is a time consuming process. Hurrying the production would compromise on quality and we will not do that in a desperate bid to get your order. In the final phase of production each ring is handfinished to perfection and strict quality checks are performed at every stage of production. Unlimited gemstone options: Kaisilver is directly networked to all the leading gemstone providers in Thailand and a few other countries. In most cases we procure our gemstones directly from miners and do the custom cutting ourselves. 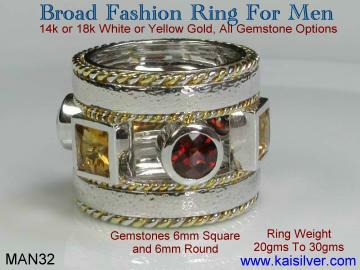 The square gems in the MAN32 fashion men's ring are of size 6mm and the round gems are also of size 6mm. This massive network gives us preferential access to over 200 million carats of gemstones and you need not be limited to the gemstones that you see on our website. 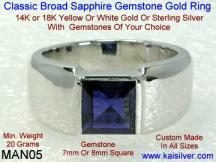 Email us with your requirements at sales@kaisilver.com and we will procure just about any gemstone for you. We do not indulge in 'close out' and 'blow out' gimmicks where, low grade reject quality gemstones are mounted in lightweight junk. All gold options: The ring shown here is a combination of yellow and white gold. You can order your man fashion ring in a single color gold (either white gold or yellow gold) or two tone gold as shown here. If you choose a white gold men's fashion ring please remember that, dark colored gems will appear even darker when set in white gold. This is because of the stark contrast between the white gold and the dark colored gemstone. Besides the color of gold, you also have the option of 14k or 18k gold for these man fashion rings. The hardness of 14k gold is much more as compared to the hardness of 18k gold and this makes 14k gold more suitable for men's rings, the final choice is ofcourse yours. High degree of flexibility and customization: Your man fashion ring will be made after your order is confirmed, we do not mass produce these rings. As a result of this, you need not settle for any 'standard' designs or limited options. You can ask for all design changes and modifications, the gemstone shapes or sizes can be changed, the band width can be reduced or increased, you can request for your name to be etched inside the band etc. If you want something totally different you can send us images of your favourite designs to be custom made. Send complete details of your requirements and an expert team will answer all queries and work out a price quote for you. Longterm durability: Fashion is about appearance and style and most buyers would not know too much about the technicalities of gemstones or jewelry. Sellers impress buyers with flashy design concepts and attractive price tags, buyers are taken for a ride and they soon find out that such jewelry is cheap only in the short run. Longterm durability of your fashion men's ring requires a combination of many factors like, good gold weight, solid gemstone mounting, a streamlined design, the right gold karatage etc. 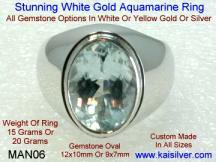 All designs at Kaisilver are researched by a team of experts. Your requirements are analyzed and recommendations are made based on the ring size, the gemstone you select and even the conditions in which you will be wearing the ring. Ensure that you get all your doubts and queries cleared before placing an order. The MAN32 men's fashion ring is custom made to be attractive, unique and sturdy. The design of the ring has been researched by our experts and no compromise has been made in quality of material or merchandise. All designs can be modified as per your requirements and you can email us at sales@kaisilver.com with any queries that you might have. Let us know if you need your custom fashion rings with a gemstone of a different shape or size and we will provide you with suggestions and a price quote. Yellow and white gold are priced the same. 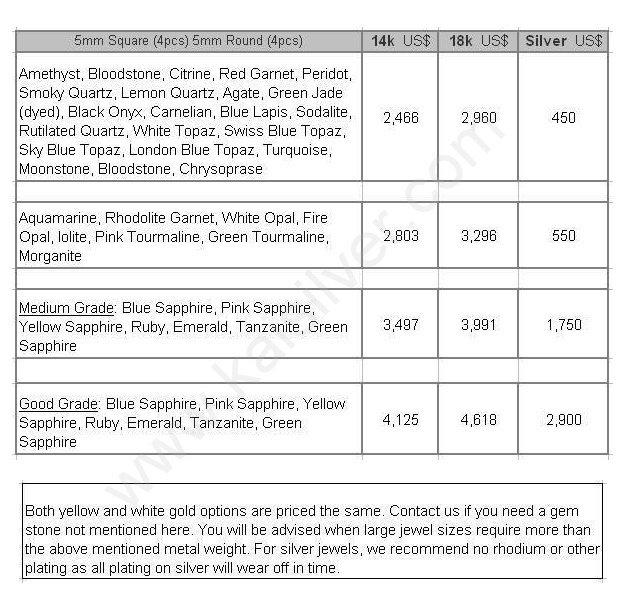 If you need a gemstone not mentioned here, please email us with details at sales@kaisilver.com and we will provide you with a price quote for the same. You can also send us images of your favourite designs to be custom made. 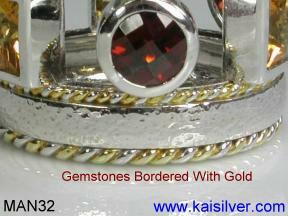 Kaisilver is the world's largest online provider of high end custom jewelry. We are directly networked to all leading jewelry and gemstone producers in Thailand. Over 3,500 of the finest craftsmen work on all our jewelry. This gigantic network provides us with preferential access to over 200 million carats of gemstones. All gemstones are handpicked by experts and custom cut for the jewelry that we make. We do not mass produce merchandise and each order is individually handled by our skilled craftsmen and artisans. Since we control all phases of jewelry production we provide you with a high degree of customization and flexibility and design modifications are possible. You can infact send us images of your favourite designs to be custom made. Kaisilver created the world's first collection of high end men's ring and the man gold ring MAN31 on this page proves that we are remain the top source for high end man rings even today. A team of Kaisilver designers and craftsmen spent several months doing intense research into the lifestyles and habits of modern men. The valuable information collected in this study was used as design input. Our rings combine good style, craftsmanship and long term durability and you are not expected to make any compromise. We released our now famous Kaisilver Claddagh rings a few years ago and it has today become extremely popular in 5 nations as the best rendition of the traditional Irish Claddagh ring. The Claddagh ring is one of history's most meaningful jewels and has a tradition that dates back to over 300 years. Payments are accepted through Paypal, Western Union Money Transfers, Money Orders in U.S$ and Yahoo Pay Direct. We are International Verified Premium Account holders for paypal and you can therefore transact with confidence. Our email for paypal is info@kaisilver.com Please let us know if you wish to use, any of the other payment methods mentioned above and we will provide you with details for the same.